Ceramics in America 2017 is dedicated to the life and legacy of Ivor Noël Hume, who passed away on February 4, 2017, at the age of 89. This themed volume, coedited with Angelika Kuettner, contains fourteen articles highlighting noteworthy ceramic discoveries from archaeological contexts in St. Augustine, Florida; Charleston, South Carolina; New Orleans, Louisiana; Alexandria, Hampton, Williamsburg, and Jamestown, Virginia; St. Mary’s City, London Town, and Annapolis, Maryland; Philadelphia, Pennsylvania; New York, New York; and Boston and Plymouth, Massachusetts. It is a fitting tribute to the man who inspired ceramic interests in so many of us in the archaeological profession. I first met Ivor Noël Hume in 1982. I was a young archaeologist and had just started at the Colonial Williamsburg Foundation in Virginia. Having been encouraged by his writings to pursue the field of historical archaeology in the first place, this was a defining moment for me. His 1969 book, A Guide to Artifacts of Colonial America, was considered the bible on historical artifacts encountered in North American archaeological sites, and it certainly helped launched my career in the field. The book remains on the bookshelves of every working historical archaeologist today. Known to his friends and colleagues as “Noël,” he mentored a legion of fledgling archaeologists who went on to become leading practitioners in the field. His texts are characterized by a sharp wit and rigorous scholarship, as well as being remarkably accessible to both public and professional readers. His unrelenting curiosity was inspiring, and his public lectures were theatrical performances worthy of any stage in New York or London. To say Noël did not suffer fools lightly is understatement, yet he amassed an incredible array of close friends and colleagues. He could be scathing in his criticisms yet incredibly generous in sharing his knowledge and opinions. Many of us had that archetypal Noël Hume encounter, when he would first pronounce you an utter idiot but then take an inordinate amount of time and effort to help point you in the right direction. A popular image of archaeologists is their protracted search for the ultimate treasure in distant lands. For most of his life, however, Noël Hume found treasure in virtually every object that came his way. He was a master at bringing the most arcane object to life. From chamber pots to the bits of ceramic flotsam from London’s ancient history that he picked up along the Thames foreshore, he could extract a story that not only illuminated the past, but also conveyed relevance to contemporary culture as well. In 2000 Noël Hume entered into an important relationship with the Chipstone Foundation of Milwaukee, Wisconsin. Noël and his first wife, Audrey, had assembled quite a collection of antique ceramics that reflected the range of things that archaeologists also find in the ground. This important material was given to the Chipstone Foundation, where is it used continuously for teaching young material-culture scholars. In 2001 the collection was published in Noël Hume’s If These Pots Could Talk: Collecting 2,000 Years of British Household Pottery. 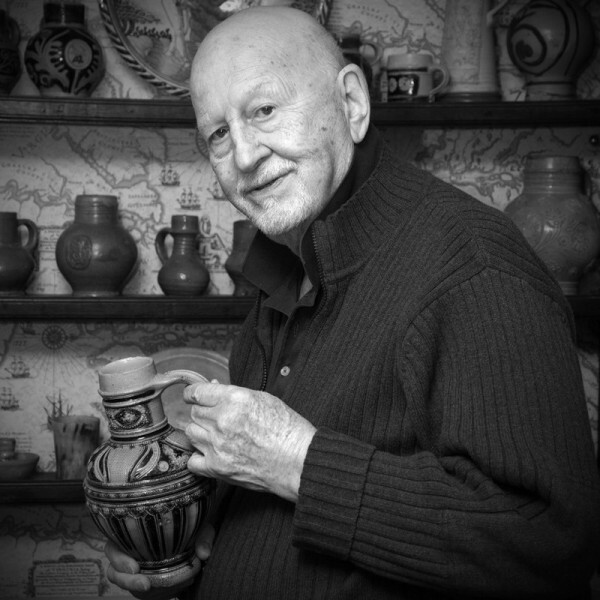 Noël’s passing is not only a great loss for generations of historical archaeologists, but his research, collecting, and publishing on ceramic topics will be sorely missed by those in the decorative arts. As editor of this journal, I had the privilege of publishing more than a dozen of his articles in the sixteen years since Ceramics in America made its debut. Noël was always conscious of his own mortality. He would submit each and every manuscript with the admonition that it might be his last. Last October I received his annual contribution, not knowing until this past February that it was, indeed, his final one—a short story about love. Noël’s wealth of published writings guarantees that he will not be forgotten, but I find it heartbreaking to edit his last offering. While the world will miss Noël’s extraordinary enthusiasm for old pots and their stories, which he brought to life with such flair, I will miss his unwavering friendship and forthright counsel on all things ceramics.